An arm and a leg for an iPhone? Mac Won’t Sleep; Lion Has Insomnia? Last night, before I went to sleep, I closed the lid of my MacBook pro (MBP). This morning when I got up, I noticed that it was still running. Lion didn’t sleep for a whole night at all. Closing the lid of MBP while the machine is running blocks the airflow and could cause the machine over heated. I tried to switch the external hard drive on and off, turn the internet sharing on and off as well. but none had sovled the problem. It seems Mac OS X Lion won’t sleep. If I unplug the power cord and close the lid then Mac OS X Lion would go sleep in a few seconds without any problems. Unplug the power cord and then close the lid. Your Mac should be sleeping after a few seconds. Then connect the power cord back. Examine the the output, and find out what service is preventing the Mac from going sleep. Line “PreventUserIdleSystemSleep 1” means something is currently preventing the system from sleeping.
) or remove the service that prevents Lion from sleeping. Usually this has things to do with Internet, printer sharing or the secondary external monitor your laptop connects to. Many thanks! I followed your advice and the problem was “nodisplaysleepassertion” whatever that means. I killed it and my Macbook now can go to sleep. Unlike me. Thanks for this tip. I also found internet sharing being a cause. It is actually in the text, in the system preferences, but like most people missed it. I imagine anything that prevents sleep should be indicated by an icon, such as a crossed out bulb. This is really a usability omission. If the system can’t sleep for any reason, then it should clearly be communicated to the user, so it can be resolved. Pretending to sleep and not really sleep just leads to the belief that the system has a sleep bug. I also believe that there should be an option to force sleep. None of the above worked for me. Only unplugging the cord would do the job, but it’s annoying. I tried this and it just kept quitting itunes for me and still wouldn’t go to sleep when i shut it…. I have tried all of this and my mac still won’t sleep. When I type in pmedit -g assertions it doesn’t list anything that is preventing the computer from sleeping. When I force it to sleep or when I close the lid (regardless of whether the power is connected) it will go to sleep for about a second or 2 and then the apple on the top will flash and it will come out of sleep. This trick helped me to find that internet sharing prevented my Mac Pro from sleeping. This allows now forced sleeping with the menu command. However, the Mac Pro still does not sleep by itself as set in the energy saver. Enable idle sleep and External media shows a 1. I use Apples Software Disk array and have the boot disk in one of the arrays, could that be the reason? I currently use the PleaseSleep freeware to force the mac to sleep but would prefer if the OS X could do the job without additional help. BTW, I unmounted all drives besides the boot drive but that did not change the status. Just a huge thank you to ALL of you above for the advice re check printer is not shared and that no print jobs are pending – I had both without knowing so took weeks of trying other things before this dawned on me that it was the reason my iMac would not sleep!! Cured instantly and I do not normally blog at all but had to say Thank you which I do again. I get this but don’t know what to do now! Tried turning off printer sharing etc nothing happens. What to do?? Thanks so much – who would have guessed that a random printer that I connected to at a friend’s house was preventing my mac from going to sleep! Opening printer print queue at ssytem preferences and deleting all jobs for printing fixed the sleeping issue. Hope this would help. After reading dozens of pages of support forums, this was the fix for me. 1. one of your printers has something in the print queue — delete any active items trying to print. 3. delete any old printers you’re no longer using. For me, I had an old printer with something still in the queue. Crazy that would cause this problem. Thanks for the help. Thanks!! This was most helpful! org.cups.cupsd was keeping my system from sleeping. Found out the airport express into which it was plugged had been knocked from the wall, the printer was turned off and another user on this MacBook had some outstanding print jobs to the printer. In short, it was “In Use”. I got the printer going once more and killed the print jobs and then after a while it went to “Idle”. Now when I check pmset I find there are 0 PreventSystemSleep processes. Most helpful indeed!! I tried this, and whenever my computer is plugged in, it is showing a “1” value for “PreventSystemSleep”, but when I unplug it, that value changes to 0. I tried to kill the program stopping the computer from going to sleep (9884, org.cups.cupsd), and terminal is saying “-bash: kill: (9884) – Operation not permitted.” Any help? Hey Taylor, it looks like the printer is causing your the problem. Try to disable it the printer sharing and delete the driver if necessary and see whether it’s fixed. Thanks for this, I had the same problem with an unused printer. The terminal showed that the org.cups.cupsd process was stopping the sleep mode, so I deleted the printer. Thank, thank you! My issue had to do with a CUPS process: I’d kill the process, it’d come back, I realized that recently I purchased a new Brother printer. Removed the two instances from the list of printers on my System Prefs, the process finally was killed. Computer goes to Sleep. Yes!!! Wow 🙂 Finally , that worked !! Thank you very much!!! You made me feel better! I thought it was an hardware problem! Sorry for my English, i’m from The Netherlands. I’m having problems to get my Macbook (2.2 GHZ intel core duo 10.6.8) pro to sleep too, due to an external projector. I use this Mac as a media player. Therefor this projector is always connected (via a HDMI/DVI adapter), and now and then used. If i want to play a movie i just turn my projector on. Most of the times i use the Macbook as a music player, en then i don’t need a monitor. I use my Iphone for navigation. So, i hardly ever need the Macbook monitor. 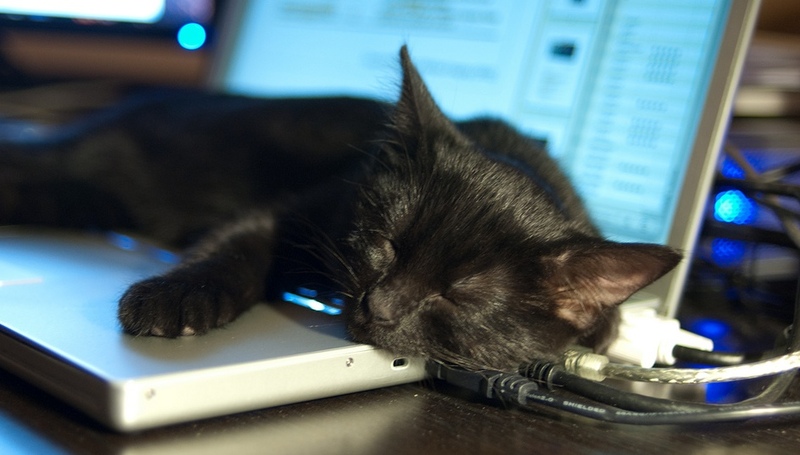 I’d like too keep the Macbook on and ready for use, but automatically in sleep mode when not used for a while. The problem is that the energy settings (system preferences)) don’t work when the hdmi/dvi is plugged in. At that moment i also used screen sharing (this Macbook screen on another Mac). Is there a way to have the Macbook connected to the Projector and occasionally use screen sharing on another Mac or Iphone but still go to sleep when not used (and of course not go to sleep when playing a movie or music)? It seems so basic to me. I don’t know how to work with Terminal, unless i know the codes to use. @MackFreak — I have the same issue on my Mac Mini. Have you figured out a fix? Pretty cool. I will keep this, but I found it the hard way, by trial and error: I had Remote Management turned on, which disables sleep apparently. Sheesh!! Deleted printer. Problem solved! You might try the “Please Sleep” app. It is a “free” shareware app. Make sure you get the updated Lion version. It works. Not sure why Apple doesn’t make this more user friendly & robust. I had this problem during Snow Leopard also. I paid the Please Sleep guy for it. But that is optional. Thank you so much for the “pmset -g assertions” it worked perfectly! I ran the “pmset -g assertions” command and discovered my Wi-Fi sharing was on. My system is working properly after turning the Internet sharing off. Thanks. Thanks so much! My problem was com.apple. Internet sharing!!! So I just turned it off! It is now sleeping like a baby and now so will I! Thanks again! Would just like to add that when I sent my laptop(under warranty) off to fix this problem they said it was the logic board and replaced it! How dumb! Thanks again! Thanks!!!! it helped. I also had the internetsharing on!! Had the same problem as Mike! Something with the printers, removed all my installed printers and sleep works just fine now! Thanks a bunch, the whole “pmset -g assertions” command line just saved me! My iMac with update to Lion did not want to go to sleep too. “pmset -g assertions” helped to identify that Internet Sharing was on. I turned it off and Mac went to sleep just fine. cups is the printing system, so I went into the system prefs and deleted my printer drivers. The system then slept. This works for me 99% of the time. Unplug, close the lid, then plug back in after 10-15 seconds. I just bought the macbook pro 13 inch (thunderbolt) and came with Snow Leopard but Apple gave me a Free Lion Upgrade. I have noticed that when I close the lid on the power chord it obviously stays awake like everyone here, but when I open the lid the airport its reconnecting to the network, in other words it disconnects from the internet when the lid its closed although its not sleeping… this is annoying cuz if I’m downloading an update i can’t close the lid. If i close the lid on battery power the it does goes to sleep. They should make an update with a fix to configure this ASAP! this topic its from July and its September already! I assumption is that it has something to do with the external monitor not being found since I have been travelling when I stalled the lion. I am very happen now that I can just simply close the lid of my MacBook just like b4. Have you tried running “pmset -g assertions” from the terminal when it won’t sleep? This may give you an idea on what is causing your mac to be sleepless. I had the same headache with my iMac. The command lets you know any conditions which may be preventing the mac from sleeping, and it seems that the conditions vary depending on whether the mac is plugged in or running on battery, which may be why you can sleep it when it’s not plugged in. This lists if a PreventSleepCondition exists, and lists the culprits. got my macbook pro to sleep with power connected. On reboot these might reload, however I now know the culprits. This done it for me. After I sudo kill the “org.cups.cupsd”. I tried reboot my computer and It still work. Finally my Macbook can have peaceful sleep. Thanks! Beautiful! “pmset -g assertions” worked perfectly. Thank you so much! Closing the lid of a MacBook (regular or Pro model) does not block the airflow and cause it to overheat. Running a closed MacBook with an external display is a configuration supported by Apple. Thanks!!!!!!! I unplug the power source and my Mac Book Pro did go sleep. Agreed, Apple needs to fix this “Lion can’t sleep” problem urgently. I think they should at least warn you when your computer is not going to sleep and have an option to override anything that is preventing sleep (at your own risk of course). But flexibility is not Apple’s forte. They don’t spend a lot of time improving existing features.